This new modern first floor apartment is adjacent to the famous kumharas chill out cafe and is ten meters from the beach, furnished to a high standard it has all the amenities for self-catering and is ideal for two couples to share as well as a family with two children. The kitchen consists of fridge freezer, washing machine, microwave oven, oven and all plates and cutlery. 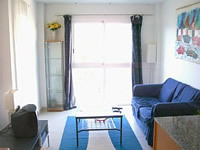 The living room has one double sofa bed with two chairs, Satellite TV, video player, stereo and entrance to two sun terraces. The bedroom has two single beds (can be adjoined) and an ensuite bathroom with WC shower and bath. Clean towels and linen are provided. 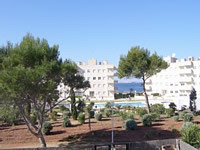 The apartment building is only 5km from San Antonio and 15km from Ibiza and is in a quiet area for times when you want to relax. The apartment offers nice private sun terraces with excellent views over the Mediterranean, the use of a community pool and shared terrace area. Ideally situated amongst the local shops, amusements and bars of San Antonio Bay. 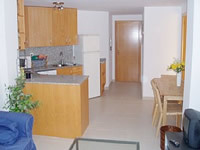 The apartment is located in the bay of San Antonio which offers the best of both worlds, it is a walk into the busy, vibrant San Antonio for the bars and disco but this area is also quiet when you need peace and quiet. Taxi ranks, bus stops, restaurants and shops are all local as well as the famous Kumharas chill out cafe where you can chill out in hammocks and enjoy the sunset whilst listening to local hippies on their bongo drums.